Before water is brought into your home, your municipality treats the water to remove all harmful substances. Some small amounts of chemicals and minerals could be left over from time to time, but for the most part, your water is free of any material that could be harmful. Water that is not treated by a municipality is usually water that becomes more of a concern for homeowners. While not dangerous to you, the water can cause a lot of damage to your home's plumbing. This water is referred to as hard water. Any water that has an above average mineral content is referred to as hard water. As it flows through your home's plumbing, small amounts of those minerals are deposited on the inner walls of the pipes. Over time, these deposits build up, eventually blocking or restricting the flow of water through the pipe. You really have to look inside the pipe to determine if you have a limescale build-up, but there are other signs that point to hard water issues. 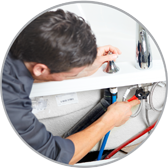 Our experienced Plumbing in Tempe, AZ will explain. Limescale is not the only damage caused by hard water as it flows through your pipes. Calcium deposits are mineral deposits that develop on the external surfaces that are exposed to hard water. They are a chalky, white substance and can be found around faucet heads and in showers. If you are noticing these deposits in your home, you probably have lime scale build up inside of your pipes. Because lime scale builds up inside your pipes, it restricts the water that flows through the pipes. While this is not a good thing, this does make it easy for you to determine if you have limescale build up. If you do start to notice a decrease in water pressure when you turn on your water, lime scale build-up may be to blame. If you suspect you have hard water issues, call professional Plumbing in Tempe, AZ today.